Virgil DeWayne Anderson was born on March 26, 1932, on the family farm in Colfax Township to J. Alfred and Helen (Jacobson) Anderson. After graduating from Belgrade High School in 1950, he farmed and joined the National Guard. Later he joined his US Army Artillery unit stationed in Fort Sill, Oklahoma. On June 5, 1955, Virgil was united in marriage to Inez Freese at Crow River Lutheran Church. They were blessed with four children. They made their home on the family farm that was first settled in 1860 by his ancestor, Matthias Fjellhaugen Johnson and his family. He loved farming and raising sheep, dairy cows, chicken and pigs. As part of his career he served as president of the Dairyman Herd Improvement Association, was awarded Kandiyohi County Outstanding Family Farmer Award in 1980, and was involved in 4-H for many years. Virgil cared deeply about his faith and loved his home congregation of Crow River Lutheran Church where he was baptized and confirmed. He served the church as Sunday School president and Congregational President during the Sunday school wing addition. He saw his faith connected to how he cared for the land. In his later years, he enjoyed making crosses for confirmation and wine glass holders for first communion. Virgil lit up when he was with his grandchildren and great-grandchildren. He appreciated following sports and working with wood, creating over five hundred sets of blocks/fencing for children that were given away by Heartland Community Action Agency and Kandiyohi County Health and Human Services. 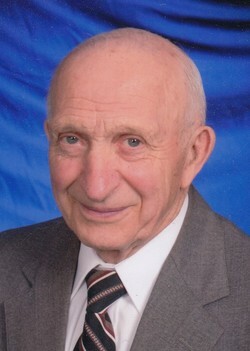 Virgil died on February 6, 2019 at Glen Oaks Nursing Home of New London at the age of 86. He is survived by his wife of 63 years, Inez; children Jon (Robyn) Anderson, Joel Anderson, Dona (Bob) Haines, and Dale (Deb) Anderson; eleven grandchildren; eleven great-grandchildren; sister, Shirley Swenson; brother, Kenneth Anderson; sister-in-law, JoAnn (Bill) Fignar and brother-in-law, Harlyn (Bonnie) Freese. Virgil was preceded in death by his parents; siblings, LaVern Anderson, Wilbur Anderson and nephews, Jason Anderson and Michael Jorgenson.